Hello friend! I hope you’ve been having a wonderful first week of back to school/post-Labour day not-quite-fall time. I’m still hanging onto summer vibes until it gets too cold for me to swim my laps outside, but there is something about September that always makes me think of setting new intentions for the year and recommitting myself to my health practices, writing, and work in general after a summer of fun. I’m putting together a schedule for my fall cooking classes, which will be out early next week and as you can tell from this post, back to writing a bit more regularly. That just leaves recommitting to my health goals. Which is why I’m running another round of my Reset Yourself Nutrition Challenge! I love this program and it always helps remind my of how good food can make me feel, while bringing daily movement, gratitude, and inspiration into my life. There’s already a great crew of people registered, so if you’re looking for a little extra support this fall you can check out all the details right here. Now let’s get to the good stuff! My Super Simple Fermented Chili Paste Recipe! This recipe is packed with heat from green thai chilies, though you can use whatever chili floats your boat. The different types will give you different heat levels and flavours, so just play around to find your favourite mix. 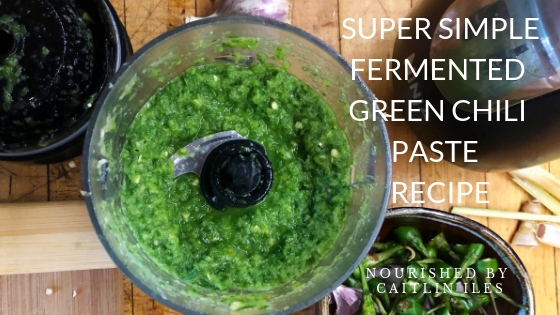 I love this recipe not only for the heat, but also because it’s a fermented food, which means it contains health-promoting probiotic bacteria to balance out the microbiome of the digestive tract and improve your digestion. Without further ado, here’s your recipe for the week! 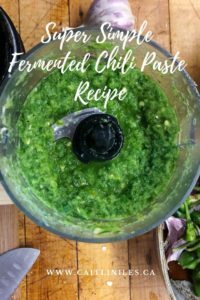 This paleo & vegan-friendly recipe combines spicy chilies with garlic, lemongrass, and green onions to create a deliciously spicy, flavourful chili paste perfect for adding to curries, soups, eggs, salsas, and literally anything else you can think of! Combine all ingredients in a large food processor. Pulse until all ingredients are combined. You may need to stop and scrape down the sides with a spatula a couple of times. Once combined pour mixture into a clean mason jar, wiping down the side of the rim. Place a small piece of parchment paper on top of the rim then seal with a lid. Set on the counter for 5-7 days. You may want to stir it every couple of days, just make sure that the rim stays clean to prevent molding. Once the fermentation is finished store in the fridge. Enjoy! Always use a clean utensil when removing paste from the jar to avoid contamination and potential moulding. Well friend, that’s the recipe for this week! I hope you enjoy it as much as I did (and the friends who taste-tested it did!). And if you’re in need of a little extra love and support on your health journey so you can start the new season feeling fab and inspired then make sure you download my FREE 7-Day Healthy Detox Meal Plan right here! Have a beautiful day and as always, thanks for your love and support! thanks for giving this paste recipe..